What is EVERWORKS's Hybrid Bandwidth System? EVERWORKS is among the 1st Datacenter Hosting Provider (DHP) in Malaysia, who deployed the Hybrid Bandwidth System that allow our customers to customize their bandwidth pattern – either to focus on local or international bandwidth. Today, a lot of web hosting companies and datacenter providers already configured such bandwidth system as their main bandwidth system that packaged to all their products, and of course it can make your package look more price competencies than who are still bundling with oversea upstream providers. EVERWORKS’s Hybrid Network is designed for our datacenter hosting clients who need to serve more Malaysian traffic than international visitors. Hence, a lot of our customer who are colocating or renting servers under this network system are usually serving more Malaysian than oversea traffic for their online business (meaning to say most of their internet traffic is from Malaysia). Colocating your equipment with EVERWORKS’s Hybrid Network gives you more than just state-of-the art datacenter facilities, but to saves your total recurrence investment on bandwidth in today’s economy. You may visit our website, www.everworks.com for more information on our server colocation package, and we have categorized our package very well with this Hybrid bandwidth. 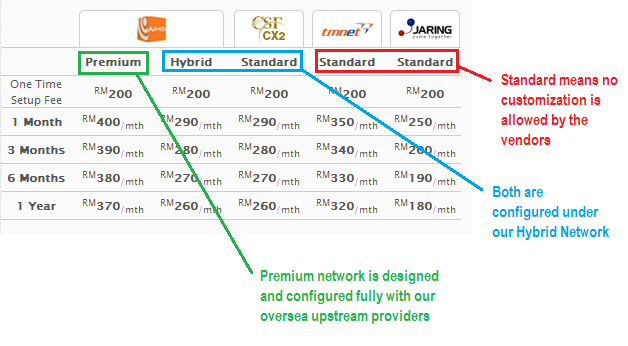 Furthermore, we still offer the non-hybrid bandwidth system to some of oversea clients, who are only or mainly serving oversea traffic (which is currently available in our AIMS Datacenter, package name as Premium). Below are the some explanation when evaluating EVERWORKS's colocation package. Example of Who Should Consider our Hybrid Bandwidth System? Finally, let's talk about how Hybrid Bandwidth is born in Malaysia's Internet Industry? Firstly, I think everyone of us should say thank to the MYIX (Malaysia Internet Exchange) - www.myix.my, who formed in 2006 after the reviewed of MCMC, with main objective of moving back local traffic being routed via MyIX away from international bandwidth links. Another simply word, without this implementation, Malaysian Internet users and providers will keep paying the higher price for their bandwidth. And this is definitely stopping the industry to grow! To know more about them, you may visit their website at www.myix.my. So what is the benefits? Of course, by escaping this, many of local operators especially the smaller ISPs enjoy cost savings due to domestic peering. Technically, by peering within MyIX network, mean the local traffic (such as a TM users accessing to Lelong.com.my servers hosted in TM or any local datacenter in Malaysis) is kept domestically, therefore, the boomerang traffic is kept at a minimum and latency between peering operators has improved. In another word, why we are paying so much higher bandwidth before this, is due to all local access are passing by all these international upstream provider such as Level3, Pacnet, PCCW, and etc. What is our Colocation Power Usage Policy? Are you vulnerable to SQL Injection?